[By Tina Koyama in Seattle] Sometimes I like to walk around downtown and pretend I’m a tourist. If I were visiting Seattle, which things would I decide were “must-sketch” icons? Certainly one would be the cast iron and glass Pergola in Pioneer Square. The first and only other time I sketched it was nearly five years ago with USk Seattle, so it’s not as if I’ve over-sketched it. In fact, as I struggled with simplifying all the curlicues, finials and other Victorian ornamentation, not to mention perspective challenges, it occurred to me that it wouldn’t hurt to sketch it more often. 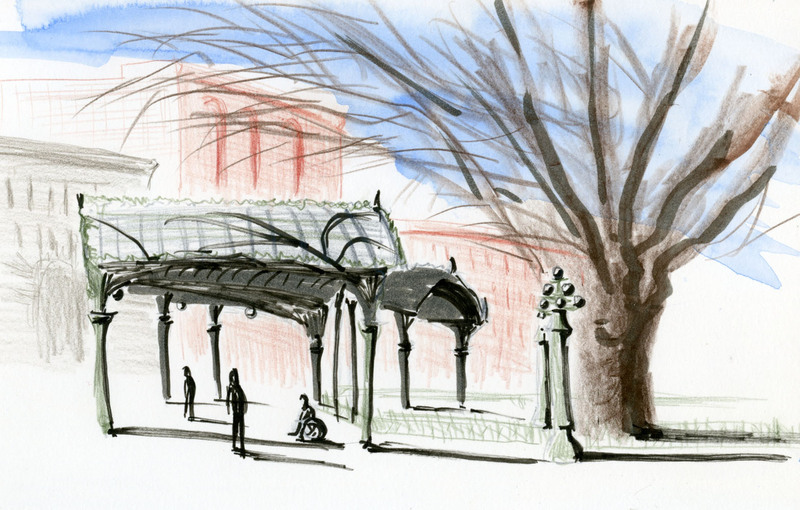 Built in 1909, our beloved pergola (a National Historic Landmark) has seen hard times. After decades of deterioration, it was finally restored in 1972, only to be destroyed when a semi crashed into it a few decades later. Thankfully, it was fully rebuilt (with reinforcement in case of future crashes). The most interesting bit about its past, though, is that it used to mark the entrance to a glamorous “comfort station” back in the day. In a Seattle Times article a couple of weeks ago, I learned that this public restroom had “tiled walls and floors, porcelain and nickeled brass fixtures, stalls of white Alaskan marble with louvered hardwood doors” and was “proclaimed ‘the finest underground facility of the type in the United States’ when it opened in 1908” for the Alaska-Yukon-Pacific Exposition. The restroom was closed in 1948, and the stairway to it was paved over, but the fixtures are all still down there. Just like a lot of old stuff from Seattle’s past is still down there. Speaking of which, while sketching, I stood at the top of a dark stairway that I thought was unused. Suddenly about 50 people appeared from across the street and walked down the stairway and into a doorway at the bottom, taking the Underground Seattle tour. I guess tourist season has begun, so I fit right in.